To claim this profile, please confirm you are Lexi Binkerd. To follow this profile, please let us know your relationship to Lexi Binkerd. 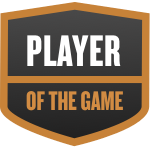 Lexi was selected the Player of the Game in the basketball game against Adams Central on Tue, Jan 15 2019. Congratulations to #33 Lexi Binkerd for being selected the Eastbrook Girls Basketball Player of the Game. Lexi's basketball stats have been updated for the loss vs. Tipton. RESULTLoss Girls varsity basketball vs. Tipton. The Eastbrook varsity basketball team lost Monday's neutral playoff game against Tipton (IN) by a score of 61-45. This game is part of the "2018-19 IHSAA Class 2A Girls Basketball State Tournament - S39 | Madison-Grant". Lexi's basketball stats have been updated for the win vs. Carroll. RESULTWin Girls varsity basketball vs. Carroll. The Eastbrook varsity basketball team won Saturday's neutral playoff game against Carroll (Flora, IN) by a score of 48-34. Lexi's basketball stats have been updated for the win vs. Eastern. RESULTWin Girls varsity basketball vs. Eastern. The Eastbrook varsity basketball team won Friday's neutral playoff game against Eastern (Greentown, IN) by a score of 36-34. Lexi's basketball stats have been updated for the win @ Blackford. RESULTWin Girls varsity basketball @ Blackford. The Eastbrook varsity basketball team won Saturday's away conference game against Blackford (Hartford City, IN) by a score of 46-18. Lexi's basketball stats have been updated for the win @ Madison-Grant. RESULTWin Girls varsity basketball @ Madison-Grant. The Eastbrook varsity basketball team won Friday's away conference game against Madison-Grant (Fairmount, IN) by a score of 44-17. Lexi's basketball stats have been updated for the loss vs. Bluffton. RESULTLoss Girls varsity basketball vs. Bluffton. The Eastbrook varsity basketball team lost Thursday's home non-conference game against Bluffton (IN) by a score of 47-31. Lexi's basketball stats have been updated for the win @ Adams Central. RESULTWin Girls varsity basketball @ Adams Central. The Eastbrook varsity basketball team won Tuesday's away non-conference game against Adams Central (Monroe, IN) by a score of 43-39. Lexi's basketball stats have been updated for the loss vs. Oak Hill. RESULTLoss Girls varsity basketball vs. Oak Hill. The Eastbrook varsity basketball team lost Saturday's home conference game against rival school Oak Hill (Converse, IN) by a score of 50-25. Lexi's basketball stats have been updated for the win @ Wabash. RESULTWin Girls varsity basketball @ Wabash. The Eastbrook varsity basketball team won Tuesday's away non-conference game against Wabash (IN) by a score of 48-45.